Scientists have theorized that it takes more than 10,000 hours of practice to become great at something. 10,000 hours! That means you have to start training your kid now if he ever wants to be the best knight he can be. If he wants to survive killing the dragon, and saving the princess. You’ll have to find the best swordsmen to teach him the craft. He will need to learn Bonetti’s Defense, the Capo Ferro attack, and the Thibault, and Aggripa swordsmanship styles. He will need to learn to ride a horse, and to joust. (You never know when jousting will come in handy.) And he will need to practice while wearing armor. This way he doesn’t get slowed down in a fight because he isn’t used to it. Well, we can’t really help with the swordsmanship, although we hear that Inigo Montoya is pretty handy with a sword. But we can help with some training armor. 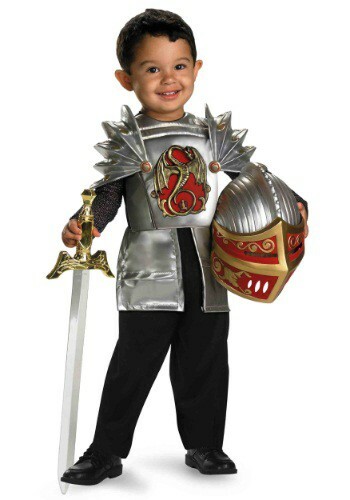 This Toddler Knight Of The Dragon Costume will help your son learn what it is like to fight with armor. He should wear it for 10,000 hours to get used to having it on. He should also train for that many hours too, just so he has an upper hand when he comes face to face with the terrible dragon who is keeping the princess locked up in the tower. We wish him luck on his quest!